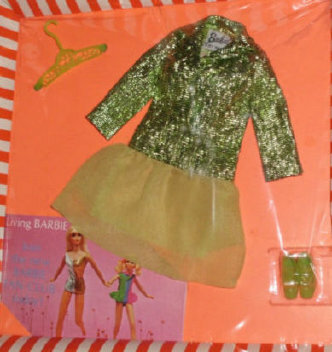 The #1116 Dramatic New Living Barbie was the first fully poseable doll. She could bend her knees, ankles and elbows, and swivel at the waist with her new body! She could also do the splits! She has blue eyes, various eye colors, and a choice of blonde, brunette or red hair. In 1971 she was dressed in a new swim suit with matching long wrap. The difference between the two dolls besides their clothing is the eyes. In 1970 Barbie had side glanced eyes, and in 1971 her blue eyes were center glanced. Barbie is marked: ©1968 Mattel, Inc. U.S. & For Pat'd Other Pats.Pend. Taiwan. Along with the doll she was packaged with her swim-suit, clear X stand, and fashion booklet. There was also a Sears Action Accents gift set that came with a doll that had the "Japan" marking and with slightly longer red hair. Dramatic Living Barbie and Live Action Barbie have the same body except there is a difference in their waists. Both are loose, but Live Action's is much looser.